Bobbi reveals her new partnership with the podcasting legend, shares the behind the scenes intel on how it all happened, plus Joe gets honest about how his plastic shoe habit almost derailed his financial career. -The importance of constantly upgrading your skills through education including online courses. That changed my entire career. My career went from growing at an okay rate, to all the sudden growing by leaps and bounds because I looked the part. 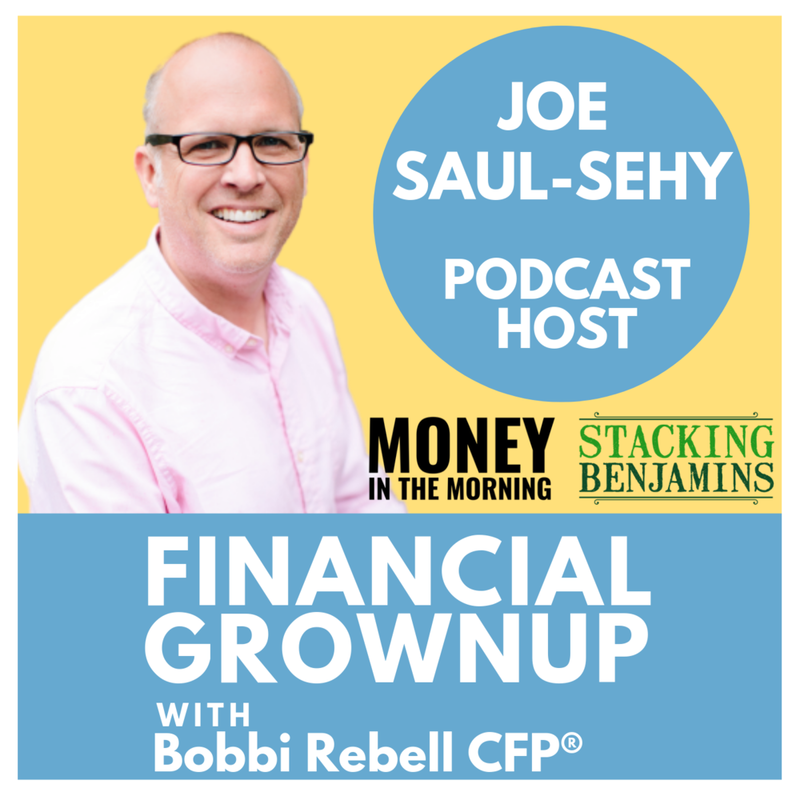 You're listening to Financial Grownup with me, certified financial planner, Bobbi Rebell author of How To Be A Financial Grownup. You know what, being a grownup is really hard, especially when it comes to money. But it's okay, we're going to get there together. I'm going to bring you one money story from a financial grownup, one lesson and then my take on how you can make it your own. We've got this. Hey friends. This episode is all about investing in yourself. Whether it comes to your wardrobe or your education as you hear and will hear more from our guest Joe Saul-Sehy is the host of the crazy popular award winning Stacking Benjamins podcast. I don't have time to list all of the awards it has won but they include Best Business Podcast from the Academy of Podcasters, and Best Finance Podcast by Kiplinger. They also win a lot of these Plutus Awards among others. You're going to really like Joe's story. If you're a good dresser you're going to feel validated for spending all that time, effort and money. If you're not such a good dresser, I hope you're going to get motivated. Here is Joe Saul-Sehy. Joe Saul-Sehy, you are a financial grownup. Welcome to the podcast. I can't believe I made it here. I must be a grownup if I made it here. You must, and you're up early these days. We're going to talk more about it later, but congratulations on the launch of Money In The Morning. It's awesome, and I love the music. Thank you. We picked it out just for you Bobbi. That's our whole thing, if we can win with Bobbi we win with everybody, so there we go. It is happy music, and I need happy music with coffee in the morning. You've evolved a lot in your grownup life, but there was a time, and we're leading into your money story here Joe, when you were a bit of a cheapskate. It wasn't just affecting you, it was really affecting your whole universe. Do tell. Well people that were watching you on camera did not see your shoes. I don't know about plastic shoes Joe. Of course you don't. Like a Payless shoes. I would go there and I'd find these shoes that looked nice, but they looked like they were polished but they really were just plastic-y. For about a year, I for those. I dumbed down my suits, I wore cheaper ties. I thought, "People trust me, they like me. I don't need to spend a lot of money on this stuff." And then I realized that everything that I was doing was wrong one day, when I finally bought some new shoes and I went to my mentor's office, and the very first thing he said Bobbi, I walk in he said, "It's about time you got rid of those cheap shoes." So now you're really investing. Yes. Yes, because I realized from the shoes, I realized I kind of have to invest in my career, and then I realized how bad everything was. The very first thing that the firm said that I hired, they said, "Well, we need to give you a big boy haircut." Because I was still wearing this haircut that I had from college, this is back when I had hair. They changed my look to be a more sophisticated haircut, to be shorter, to be more conservative, to look the part. They went with me shopping for clothes to show me how I could still spend less money on clothes, but I had to dress much more smart. I had to be trust ... and it's funny how that changed my entire career. My career went from growing at an okay rate, to all the sudden growing by leaps and bounds because I looked the part. I don't know about you Bobbi, I don't trust people who look too good, people that are dressed to the nines. For whatever reason I don't trust them, but that doesn't give you an excuse to not dress appropriately, and I guess even to widen it, to take responsibility for your career. We have to take responsibility for this thing that we call a career and make it our own? Expending on that, what is the lesson for our listeners from the story? I think the big lesson is don't wait for somebody else to give you this feedback about your career. Look in the mirror, and not just in the physical aspects like I was, but look in the mirror when it comes to your relationships with your family, with your relationship with money, with your relationship with your job. It's far easier, everybody wants to pinch pennies, it's far easier to go make a lot more money that it is to pinch pennies. It's funny, we might be able to save 50 cents or a dollar, but we could make $100 this week if we just looked outside ourself and went looking. I mean, there are so many job opportunities online, there are so many things to do. Look in the mirror and take responsibility for yourself was something that I learned that day that I try to teach other people now. And grow the top line. Grow the top line, amen. So give us a money tip, something personal that you and your family do that people can maybe make their own and do right away. I just said, focus on the top line Bobbi, but I also look at the bottom line. Because if we can stretch the difference between the two of those, then that's where we experience growth. In a lot of families what I noticed is that one person in the family, like you have a budgeting partner, a spouse, a significant other, one person usually knows where every dollar is, every dime is. The other person's in a place I refer to as fantasy land. They think they know, they have this general feeling, but they also know the other person's taking care of it. That's when fights begin. That's when bad things happen in a relationship, it's because the person in fantasy land all the sudden realizes the fantasy doesn't look the way they thought that it should have, so there ends up being friction. To avoid friction, something that Cheryl my spouse, and I implemented and that I like to teach people how to do, is just have a quick weekly meeting. Maybe 15 minutes over breakfast, or I prefer over wine. In the evening, not wine at breakfast. I mean, I'm not judging but you know. And they're never in your favor. They never ever ... It's amazing that none of them ... Yeah, isn't that shocking. Yeah, business is always taking from me. And then also look for recurring expenses that you don't need anymore. I found just a couple weeks ago that there's been a recurring meeting, because we miss meetings from time to time and I must have missed it the last two years in a row. There's a Norton subscription that I've had for the last two years that I don't have hooked up to anything. That's a $100 a year for this subscription. It was really ... Luckily I caught it. I was able to get back this year, I can't go back and get the year before that, but have that money refunded to me. Yeah, which also is cool. But the best thing is, Cheryl and I now go through the week and we know where the dollars are going to be spent. If things change we've got this open line of communication. I've got to tell you, it's so fun. The weekly meeting is so fun. Good. And you know what's really fun? Is spending less on your taxes. I have a CFP, but I have to tell you, especially because I got the CFP before the new tax law was passed. I find it a little bit overwhelming, but you have out that can help a little bit. I would want that. I would do that one, but maybe not other people. [crosstalk 00:09:10] Yeah, you and I are money nerds so that's great. But here's what somebody did with me, this is the genesis of the course. I thought taxes were kind of mystical and I would ask people, "Can I write this off? Is this something that maybe I can take advantage of? Is this taxable? Is this not taxable? How does it all work?" Somebody sat down with me and walk through the 1040 and how the 1040 works, and then the itemized deductions page and how that works. Once I knew that, and what's cool is it's only three pages, once we walked through that I totally then could see what I could write off, what I couldn't write off, where my opportunities might be, how my retirement plan fit into the big picture, what the downsides might be in the future, what tax problems I might have in the future. We call the course How To Legally Cheat On Your Taxes, and it is a lot of fun. It's a do at your own pace course. It teaches you how taxes work. You can do two things. Number one, put Humpty Dumpty together, like right now during tax season. Put things together- Yeah, put things together in a way that helps. But that's not where the magic is. I think the real magic is doing things through the year so that when you're trying to put Humpty Dumpty together next year, you're able to do that much, much better because you knew how taxes worked going in. I think that the powerful thing. That's the reason we created it, was to try to get people that same leg up that I got. I love that. Where can people find that? And where can people find you? I know Facebook in the morning, it's fascinating people. You can him do Money In The Mornings on Facebook and you can see how everything is made. Yes, and to make myself more natural on camera and try to get used to that. I started doing these daily Facebook Lives and say, "You know what, we're going to do this show without a net." So Money In The Morning is without a net, five days a week, wherever you're listening to this show. We just do two quick headlines. It's live, and man sometimes bad stuff happens. Which I think some people listen to it just to hear the car wreck. Right, right. Just to hear some of the bad stuff that sometimes happens, because you can't take it back if it's live. I know. All right, so where can people find you and the course and everything? Yeah, yeah. That's wherever you listen to this podcast, is where you can find Money In The Morning or Stacking Benjamins, our main show. The course is at learn.stackingbenjamins.com, that course, and we have a couple others, Save 50% Of Your Income and a quick hit course on your benefits package, so when you are going through open enrollment every year. Just a very quick, like, "What do I need to remember while I'm doing my open enrollment?" Cool. Where can people find you social media before we go? I am @AverageJoeMoney on Twitter, stop by and say hi. On Facebook it's facebook.com/istackbenjamins. Joe Saul-Sehy, thank you so much. Thanks Bobbi. This was so fun. I'm so happy that I'm finally a grownup. You are. Congratulations Joe. Here is my take on what Joe had to say. Financial Grownup tip number one, wear quality clothing. This is something that previous guests Kevin O'Leary touched on as well with respect especially to his mother. Not only is it important to look your best in business, but you often come out financially ahead. I get tempted like everyone by the fast fashion places. I always get burned. I buy a sweater for 20 bucks, it looks identical to the one for 200 in the department store, so I think I'm really smart. But then, after a couple of wearings, it's trash. I'm going to let you guys in on an open secret. Notice that I said wear quality clothing. I did not say buy. If you come see me speak, I am often wearing a very expensive designer dress that I don't own. It's rented. The designer handbag I'm carrying, you got it, probably rented. That way I get the benefits of always showing up in a well made dress without having to constantly invest in buying expensive clothing. Financial Grownup tip number two, always keep learning. Joe talked about education, so whatever interests you or will further your career, get better at it. If you work for a big company, always find out what they will pay for. My first employer, CNBC, paid for my CFP classes. There are also incredible online resources from LinkedIn to Udemy, even Investopedia has great online classes. In fact many top universities are putting their classes online and you can often audit them for free. Make yourself smarter, it will probably pay off for you financially, but you'll also probably enjoy it. Thank you all for your support and feedback. I truly appreciate everyone who has subscribed, rated, reviewed and shared the podcast. It's amazing. Please, follow me on social media @BobbiRebell on Twitter, @BobbiRebell1 on Instagram. Go to my website, sign up for my newsletter so I can keep everyone posted on everything going on with the show. I hope you enjoyed Joe's story and that we all got one step closer to being financial grownups. Financial Grownup with Bobbi Rebell is edited and produced by [Steve Stuart 00:14:28] and is a BRK Media production.